Los Angeles (May 31, 2018) – Heading into its second weekend at the box office, “Solo: A Star Wars Story” and “Deadpool 2” in its third weekend, lead Fandango’s weekend ticket sales and Fanticipation buzz indicator with scores of 86 and 77 out of 100 points, respectively. Fans purchasing tickets for “Solo: A Star Wars Story” on Fandango will receive an exclusive complimentary poster from Fandango FanShop here while supplies last. Limited Edition Solo Fandango movie gift cards are also available at: (https://www.fandango.com/giftcards). “Deadpool 2” ticket buyers will also receive an exclusive complimentary poster illustrated by “Deadpool” creator Rob Liefeld with their ticket purchase here, while supplies last. Fans can also purchase limited edition “Deadpool 2” Fandango movie gift cards (https://www.fandango.com/giftcards). 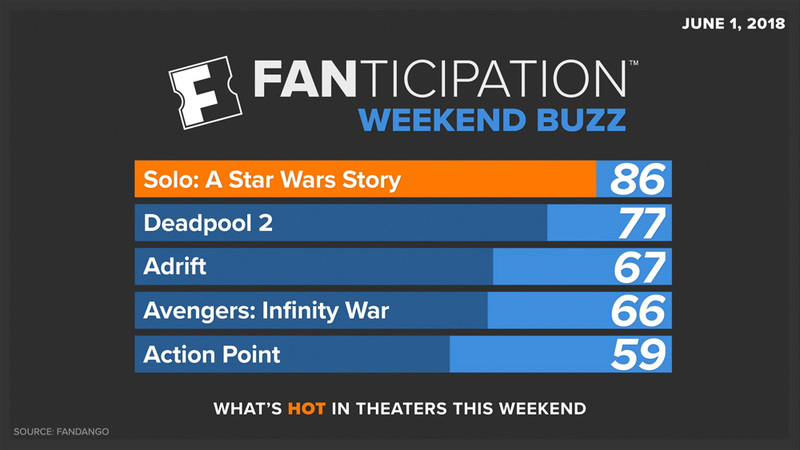 Known for having its finger on the pulse of moviegoers, Fandango’s movie buzz indicator, Fanticipation, provides statistical insight into the movies fans are planning to see in a given weekend. Fanticipation scores (based on a 1 to 100-point scale) are calculated via an algorithm of Fandango’s advance ticket sales, website and mobile traffic, and social media engagement. Fanticipation is not intended as a forecast of the weekend box office; it is a snapshot of movie fan sentiment. Fandango is the ultimate digital network for all things movies, reaching more than 60 million unique visitors per month across its portfolio of digital properties, according to comScore.